OROKLINI First Floor Apartment with Private Gated Pool. Sleeps up to 2 from €260 p/w. Sea Breeze Villa is a luxury villa on a small exclusive development of five villas in Pyla, off Dhekelia Road. This villa is not in Pyla village itself, but on the outskirts very close to Larnaca Bay, just a hop, skip and a jump from the beach. Large outside area with an 8 x 4 swimming pool, bbq area and gardens. Inside comprises lounge/dining area and kitchen and downstairs cloakroom. A marble staircase takes you to a large landing where a door leads to a private terrace with panoramic views of the sea, mountains and surrounding villages. There are 3 large bedrooms, master with ensuite and a separate family bathroom. Furnished to a high standard, this villa has everything you require for a truly luxurious holiday. The beach is a 5 minute walk from the villa and 10 minutes away are restaurants, bars and shops. Ideally located to all amenities you would require from a holiday. Car recommended for sightseeing, but not essential. If you are interested in renting property 1025, please fill in and submit this form and we will contact you shortly, or please use our contact form if you also want to send us a message, quoting Ref 1025. 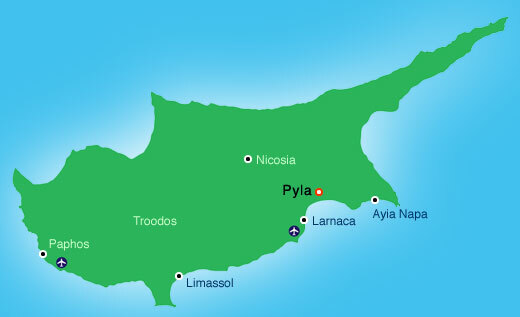 Conveniently located with easy access to Larnaca, guests can take advantage of all that the large town of Pyla has to offer. Blue Flag sandy beaches with crystal clear blue waters, the International Airport, commercial port, interesting archeological and cultural pursuits, plus a wide variety of leisure activities such as diving, fishing, and water sports. There are plenty of bars and restaurants, all of which incorporate the friendly and relaxed atmosphere which is typical in this popular holiday area.